In a mixer, add the sugar, egg, milk and vanilla extract. Mix on medium for 5 minutes to fully dissolve sugar into mixture. Combine flour, salt, baking powder and cardamom in a medium bowl. Slowly add in flour mixture and mix on medium low speed till combined. Remove bowl from mixer and place donut dough in the fridge for 20 minutes to chill slightly. In a small saucepan over medium low heat with a thermometer attached to the side, add the vegetable oil. Allow oil to reach 365°F. Take 1 teaspoon of dough and drop it into the hot oil. Cook on each side for 3 to 4 minutes or until perfectly golden crisp on the outside. You can fry up to 3 donut holes at a time. Remove donut holes from the oil and place on a paper-towel-lined plate to drain. Continue the process until all the dough is gone. In a small bowl, add the powdered sugar and orange juice. Whisk together until it is smooth and there are no sugar lumps. Then pour over donut holes and allow orange glaze to set for an hour. Keep the temperature of the oil at a steady 365°F; if it goes any higher, the donuts brown on the outside too quickly and the inside stays raw. Use a teaspoon ice cream scooper with a metal swiper inside for perfectly shaped round balls of dough. After a big holiday meal, you can't imagine eating something else, but still crave the reward of a sweet dessert. 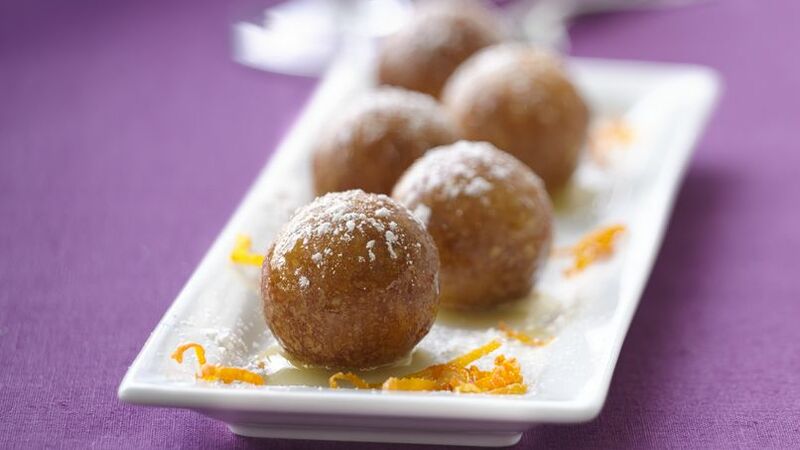 This is my answer to fitting just a little something more into your full belly: donut holes! Everyone loves a fresh homemade donut hole. This recipe calls for a touch of cardamom and an orange glaze that work right along with the holiday menu. Tell yourself you'll eat just one, but watch your hand reaching out for more.